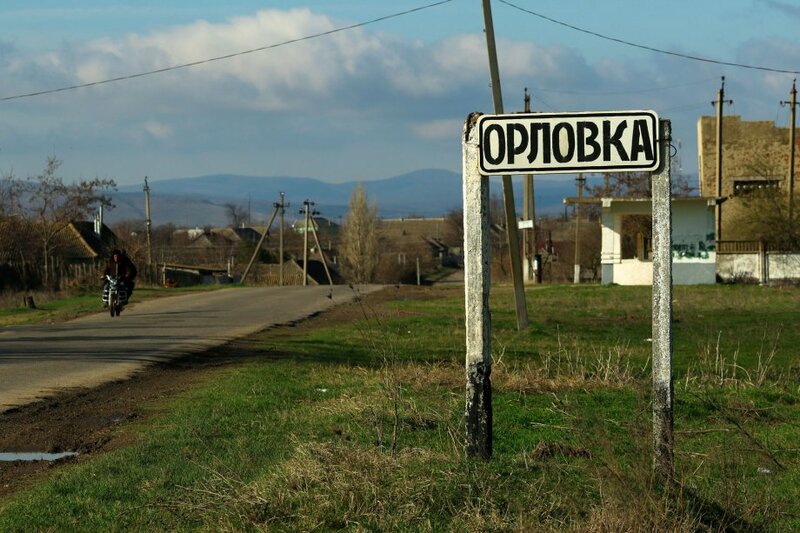 Until a year ago, the village of Orlivka in the south of Odesa region was not much different from other Ukrainian border villages. There were huge wetlands, the glory of the old collective farm and the problem that young people moved to live in Romania. Everything started to change after Orlivka was one of the first in Ukraine to develop an action plan for adaptation to climate change. It turned out that the temperature in summer would continue to grow here, and the coastal houses and vegetable gardens would soon be flooded with water. The bad weather forecast made people in Orlivka become more active. Near the village, hectares of willow were planted to heat the local culture house and absorb excess moisture, buffaloes were brought in to the abandoned swamp and a unique eco-park is about to be opened. ZAXID.NET spent two days in Orlivka to understand how a herd of buffaloes can change people. Orlivka is located 300 kilometers from Odesa and looks like a classic Ukrainian abandoned village. It is possible to get to Romania in a few minutes, since two countries are connected by three kilometers of crossing over the Danube River and long-standing family ties. Among themselves, people speak only Romanian. The village is surrounded by water on all sides. On one side, flood plains and the Danube, on the other – a number of large lakes, in particular Lake Kartal. Lakes and the territory adjacent to the river are actively overgrown with reeds and other vegetation. These processes have dramatically accelerated over the past few years, due largely to a global phenomenon such as climate change. “Buna dimieniatsia” wishes “Good morning” in Romanian Mykhailo Kuvanzhy, the head of Orlivka village council. “Buna dimieniatsia” an ecologist from Odesa Oleg Diakov answers and in a whisper adds: “I do not really know Romanian, but this phrase is easy to remember, it sounds like Russian “budiem mieniatsia” (“we will change” in English). Like most people in the village, Mykhailo Kuvanzhy considers himself an ethnic Moldavian. In general, the peculiarity of the region is that villages of different nationalities are located here: Bulgarian, Moldavian and Romanian. “We celebrate Christmas on December 25, not January 7, just got used to it. We have a custom – we make masks from animal skins and colored ribbons and walk from yard to yard,” – Kuvanzhy smiles broadly and holds out a small mask of rabbit skin as a gift, waiting for a reaction. In autumn last year, another feature appeared here. 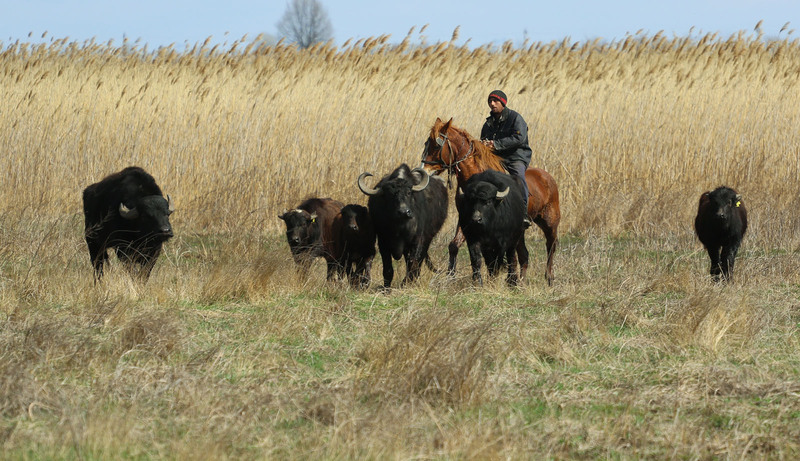 A herd of buffaloes was brought in to Orlivka from Transcarpathia. 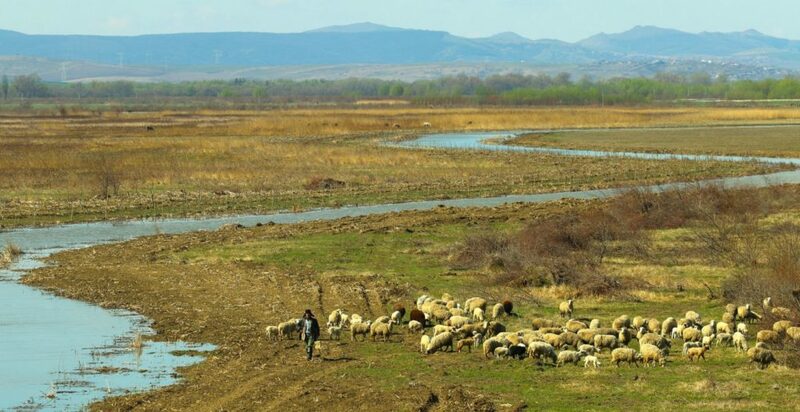 The animals were settled in order to clear the reservoirs and channels of the Danube region from excess vegetation. They not only eat reed and other marsh plants, which due to climate change have become many times larger, but also clean river beds from silting. 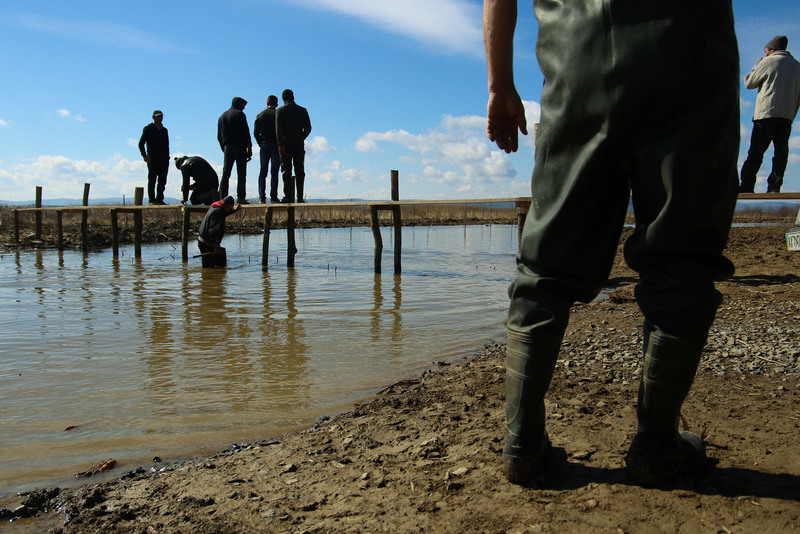 Thus, new settlers help the village adapt to climate change in the Danube region. “In fact, buffaloes were here fifty years ago. But later this species disappeared. We can say that we are getting back to basics,” Mykhailo Kuvanzhy says in Russian, switching to Romanian while asking his secretary to make coffee. “Buffalo weighs about a ton, it’s big and scary. People started to come here just to see them with their own eyes. This is exactly what we expected,” says happily the ecologist of the NGO “Center for Regional Studies” Oleg Diakov and invites us to go and look at the buffaloes. On the outskirts of the village reed marshes and meadows begin, where willow is planted. 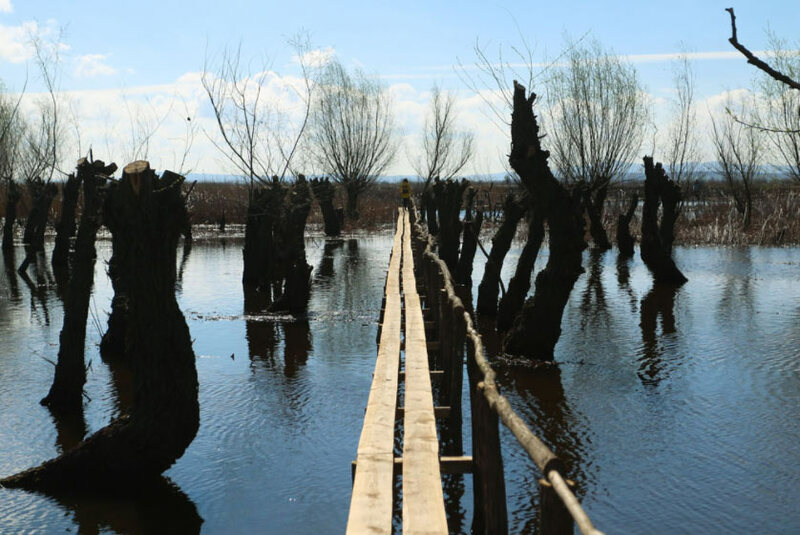 Hundreds of identical willow trees stand directly in the shining water, and wooden bridges with a height of one and a half meters are laid between them. Walking in the park is basically possible through bridges, only somewhere there is a dirt road. The idea of an eco-park is to make a territory on the principle of safari – people can come here on an excursion to the wild and take pictures with animals. The area of the future eco-park is 150 hectares. “Here begins the territory of the ecological park Kartal, which will open in the summer of this year. All the swamps can be walked through narrow wooden bridges that resemble paths. They were specially built for future visitors. 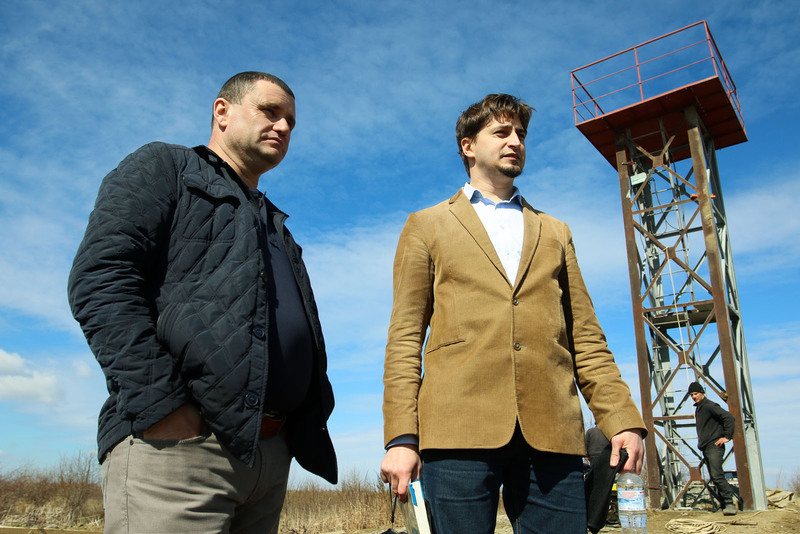 And the entire territory can be viewed from the observation tower, which was completed just yesterday,” says an ecologist Oleg Diakov. 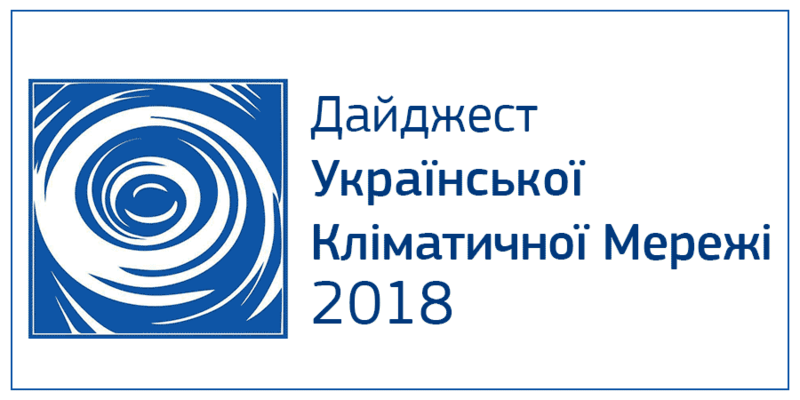 Oleg Diakov works as a Senior Research Fellow at the NGO “Center for Regional Studies” and develops an action plan for adaptation to climate change for Orlivka. The ecologist examines the entrance to the park, changes shoes into gray boots, and paces out the distance to a place where the banner with information about the eco-park will hang. The park will be opened within the framework of the climate change adaptation program, which will help increase the amount of river fish and wild birds, expand the number of pastures and improve the quality of water. “You see, there is already an opening for setting up a plate with data about the park. I will unfurl the banner, and you take a photo of me and my colleagues at this place,” Diakov asks, holding out the camera, then waves to the head and his colleague to join him for a photo. Then we continue to go farther to the pasture of the buffaloes. Willow was planted here for a reason, notably in the framework of adaptation. Olexandr Dishli explains that nature of the Danube region is very different from nature, for example, in the West of Ukraine. Many trees simply do not grow in local conditions, but willow grows well. This year two hectares of willow were planted in the village. The tree will help Orlivka villagers refuse to use gas. Willow as well as reed and various shrubs are planned to be used in modernized boilers. The first one, bought at the expense of international donors, was installed in the village culture house. Mykhailo Kuvanzhy leads us through bridges, and later along a dirt road to a herd of buffaloes. There are no tall trees in the eco-park, therefore the wind blows through the territory, people should talk loudly to each other, sometimes even shout. Buffaloes graze at a distance of a few hundred meters from the observation tower, 14 black silhouettes are visible from afar. We are joined by the director of the local culture house and his friends. All are about 20 years old. Boys listen to “Splin” on the phone and sway on the bridges, checking for strength, they say that they have walked here for the first time. “Urge them on closer to us, to the tower,” Mykhailo Kuvanzhy shouts on the phone. He calls a shepherd who examines the territory on the horse. The head ends the conversation and puts his hand to his forehead to look at the buffaloes. From afar it is clear that the shepherd on a horse is speeding up and urging five animals forward. “We brought bulls from Transcarpathia. They were specially selected for us by the German ecologist Michel Jacobi, who moved to Ukraine to revive the breeding of buffaloes. Have you ever seen how buffaloes look in the mountains? They look exotic there, but here – organic,” says Igor Studennikov, director of the Center for Regional Studies, watching with a smile how animals are slowly approaching. Water buffaloes were brought in as part of a project implemented by the Odesa NGO “Center for Regional Studies” in cooperation with the National Ecological Center of Ukraine under the program “Climate Forum East II” ((CFEII)) with the support of the European Union, the Austrian Red Cross and Austrian Development Agency (ADA). Some of the animals were also provided by Dutch True Nature Foundation. Five buffaloes come closer without haste. The biggest one is Mishka, it weighs more than a ton and really loves being hugged and scratched. “And don’t they react to red color?” – we ask Diakov before approaching the animals, since the photographer has a red jacket. “Like all cloven-hoofed mammals, buffaloes react not to color, but to movement” – explains the expert. Misha comes closer to Oleg Diakov and falls to its left side. A few minutes after scratching, Misha turns over on the other side. “They are like Ukrainian elephants, they are very smart. Buffalo cows do not give milk until they begin to trust the owner. It takes a lot of time. 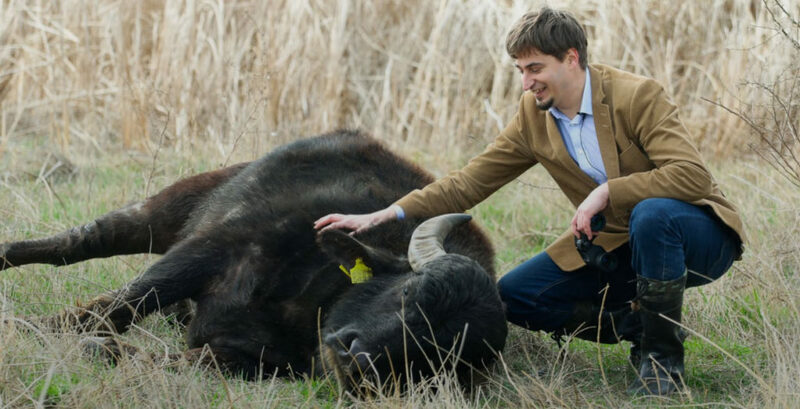 The previous owner Michel told that there were cases when animals gave their first milk only after three or four years,” says Oleg Diakov, stroking the buffalo over the spine. According to the ecologist, all these settlements in the south of Bessarabia have already suffered from lack of drinking water for many years, as well as hurricanes, tornadoes, droughts and hail. Part of the territory of the rural community is under threat of flooding due to heavy showers, as well as from the Danube during extreme floods. While ecologists are looking at the buffaloes, another bridge near the observation tower is being completed. About ten men are walking waist-deep in the swamp and nailing the boards for the future bridge. According to research, the future increase in the average annual temperature by several degrees will reduce the period with temperatures below 0 ° C, prolong the dry season, increase the rate of evaporation, increase the number of extremely hot days and reduce the period with snow cover in this area. Mykhailo Kuvanzhy, the head of the village council of Orlivka, asks to visit the local culture house that is the main building in the village. The two-storey building has hardly changed since the times of the Soviet Union, there is still a molding of hammers and sickles on the columns here. In the culture house the sounds of the piano are heard, local children are training before the concert, which will be in a few days. During the intervals a tape recorder is switched on and Russian songs play loudly. The head of the village council invites us to the boiler house, where the renewed boiler has been working since last year. 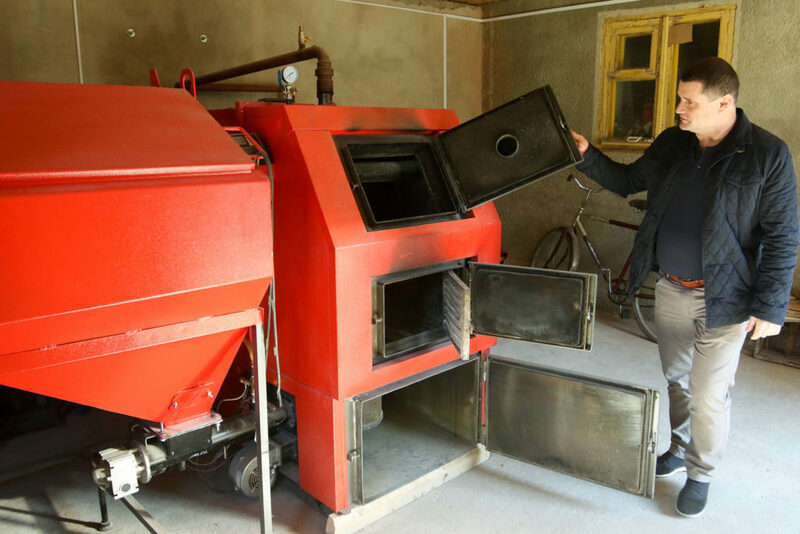 The boiler was also replaced in the framework of the adaptation program, it burns not only pellets, but also ordinary plant debris. “Now it is 18 degrees Celsius in the room in winter. During the cold season, different circles are working here, we hold celebrations and, of course, it is convenient to have weddings here”, – laughs Kuvanzhy. “A similar project has already been implemented in Vylkovo, there is a line for briquetting reed waste. And willow will also be used here, it helps to restore and clean flood plains of the Danube Delta. In addition, the burning of local briquettes does not lead to additional greenhouse gas emissions, as there is a carbon cycle in the region,” says Oleg Diakov. 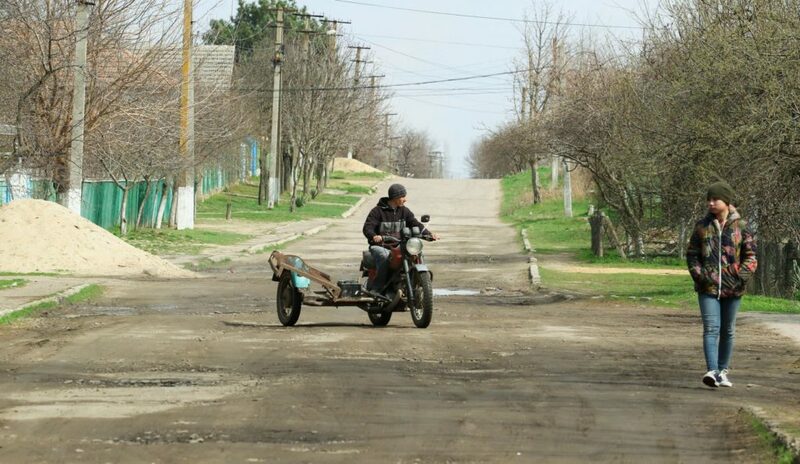 After a long excursion to Orlivka and the eco-park, the head of the village council asks everyone to come to the local club for dinner. In the assembly hall with a red shiny ceiling, under which weddings usually take place, there are several large bowls with fried fish and wine in plastic bottles. “This is our local fish, it is always the most delicious where it is caught. I think this can be another highlight of Orlivka, people will be able to come to us for fishing,” Mykhailo Kuvanzhy philosophically says and invites us to eat fish. If the temperature in the world rises by 3 degrees, the coastal territory of the Reni district, including Orlivka, will be under water. The map on the left shows how the territory looks now, on the right – how the territory will change when the average annual temperature changes by 4 degrees of heat. According to the forecasts of scientists, the average annual temperature can grow by 4 degrees by the end of the century, if the amount of emissions into the atmosphere does not decrease.